You can be forgiven if you have a tendency, when visiting a museum, to pivot on your heel and turn around when you come across a projection room. They are becoming increasingly prevalent and the works on display can too often disappoint. Frequently the production quality is low, the imagery lackluster, and the purpose, if we presume there to be one, opaque. But that’s not the case with Amar Kanwar’s “A Season Outside,” now on exhibit at the Brigham Young University Museum of Art’s Electronic Media Gallery. If you catch the end of the 30 minute loop you may get a clue as to why: credits roll for script, direction, camera, music and more. “A Season Outside” has the trappings of what we call film, though it’s not strictly narrative in the sense of a feature film or documentary. Rather, it is a poetic musing with words and visuals. 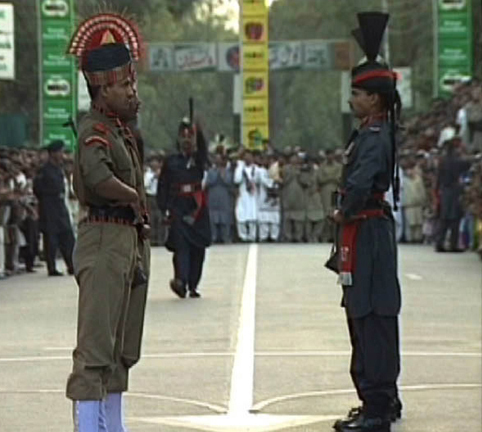 The film opens with the sunset ritual of closing the gate on the border at Wagah-Atari, a town divided during the partition of India and Pakistan in 1947. Like prancing peacocks, soldiers from each nation beat out an elaborate military ceremony to the applause of audiences on both sides. Another shot follows the elaborate, international exchange of parcels from blue-clad porters in Pakistan to red-clad porters in India, separated only by a white line and the threat of violence from nearby guards. The film examines violence in other parts of India, from state-sanctioned violence to impromptu ram fights and refugee camps along the Tibetan border. All the while, in a voice over that is at times difficult to understand, but hypnotic nevertheless in tone and cadence, Kanwar examines the effects of violence in his own family, his country and the world at large. The visuals are compelling in their own right, but this plaintive voice stitches them together, providing a narrative thrust that will keep you in your seat if you’re wise enough to turn that corner into the darkened gallery. Amar Kanwar: A Season Outide is at the Brigham Young University Museum of Art through January 17.